OPPOSITION leader Bill Shorten says Labor’s candidate for the WA seat of Curtin Melissa Parke did the “right thing” after withdrawing from the election contest over controversial comments she made about Israel. 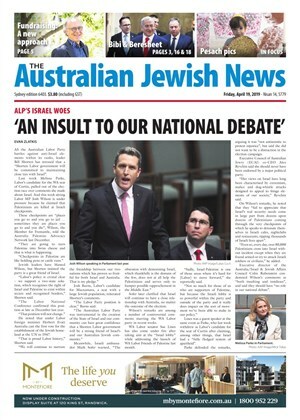 PRIME Minister Scott Morrison has issued an emphatic warning about the gulf between the Coalition government's policies on Israel and those of the ALP. 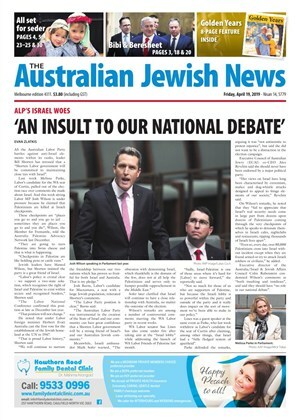 THE Executive Council of Australian Jewry (ECAJ) has called Labor's pledge to reverse the Morrison government's recognition of West Jerusalem as Israel's capital "hasty and ill-advised". A NSW Labor motion urging the next Labor federal government to recognise Palestine will not impact federal Labor’s foreign policy, according to several federal Labor politicians. A PROPOSED motion urging the next Federal Labor government to recognise Palestine will be put forward at this month’s NSW Labor State Conference. ISRAEL'S Minister of Environmental Protection Ze’ev Elkin visited Australia this week, meeting with state and federal MPs to try and establish deep cooperation between Israel and Australia in the field of environmental protection. THE Leader of the Opposition in the Senate, Penny Wong, insists that the ALP has been a longstanding friend of Israel and will continue to be. SHADOW foreign minister and Deputy Labor Leader Tanya Plibersek reiterated Australia’s support for Israel in its desire to achieve a two-state peace outcome with the Palestinians, in recent remarks to the Australia/Israel & Jewish Affairs Council.